To help with this we are offering a Hands ON! Luthier Performance Clinic focussing on the nitty gritty areas you have told us, you want to cover and geared around the common build platform of an S-type, bolt on neck, trem based guitar. “If hesitating to go on a Wudtone Luthier Performance Clinic then don’t. After 30+ years as a performing musician, guitar hoarder and tinkerer, I’d reached the stage where I understood what made a great guitar and a great set up yet after a couple of builds needed confidence to tackle nut cutting and fret levelling, dressing etc. I’d seen guitar set up courses advertised but they didn’t include nut cutting and dressing (a huge oversight) and I needed to learn this and more so Andy’s course was too good not to try. 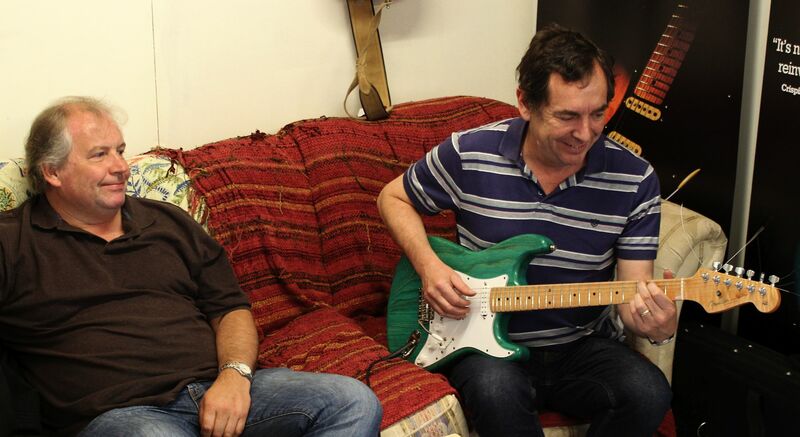 It was all very relaxed in nice surroundings, easy to understand and to our benefit very hands on with our own guitars. In fact I’d do it all again just to get away from everything and be able to focus on my next guitar with help from Andy. I’m already contemplating my next build and with the aid of a few simple tools feel confident that I can use all the new skills gained to produce another stunning guitar. Another thing I can’t praise highly enough are the Wudtone bridge and trem blocks. The improvement in tone/sustain and the reliability of tuning is black and white and probably the biggest most noticeable improvement to a guitar I’ve heard. After demonstration of the above delegates can apply the techniques demonstrated to their own build projects so they are then ready to move on to the next steps. After earlier set up of alignment and fret levelling, this section looks at truss rod adjustment and the effect of neck relief on playability. A key focus will be tooling. What are the specialist tools you really do need and also what jigs/tooling you can easily equip yourself with to do the above with custom shop quality? Passion – to create your own holy grail guitar. It is strongly recommended that delegates bring their own projects with them to make progress with during the clinic. Places are limited to 2/3 maximum per clinic. This is so that delegates will be able to use the techniques learned on their own projects, thereby gaining real hands on experience and the most value and satisfaction from the two days. To this end it is recommended that delegates bring bodies/necks ready for assembly, or at guitars that would benefit from fret work including, levelling, crowning, polishing and or nut work required. CLICK HERE to see weekday or weekend dates available and book your place online. 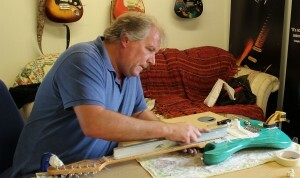 “I have just arrived home after the second, and final day of Andy’s guitar workshop. Two of us took part in the sessions, I took my partly built guitar, and Dave took his rather beautiful green S-type project. The two day course covered a lot of ground including fret levelling, crowning the frets, fitting and cutting the nut. I have tried to do this before, but with limited success, however with Andy’s guidance and help I have learned how to achieve these skills accurately and efficiently resulting in a guitar that is really lovely to play, and I now have the skills and confidence to improve my other previous efforts! Above all it was a thoroughly enjoyable couple of days.